We don't normally come across whacky desktop towers until Computex (which is less than two months away), so this beast of a PC at IDF was a nice surprise for us. Courtesy of Chinese startup Micle, this case is awkwardly called the "Proud of Blood" but has nothing to do with Diablo; instead, you're better off remembering it as the 90cm-tall desktop tower inspired by Harley-Davidson motorcycles. All the details are there: the V2 engine, the pipes, the tank cover, the spoiler and more. Unlike the plastic prototype we saw, the final version will be mostly aluminum, according to Micle co-founder and famed local modder Wei Zheng. 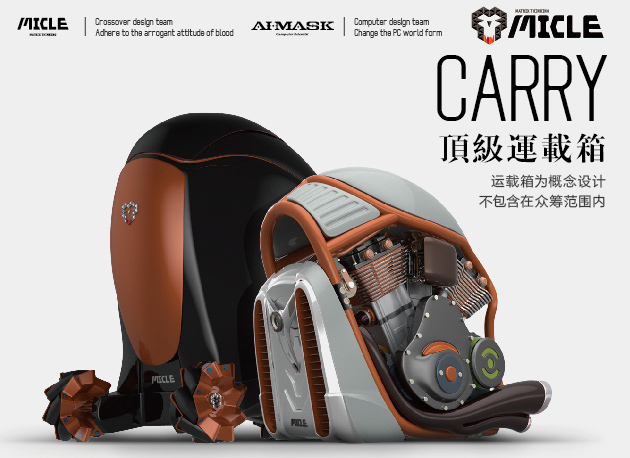 Before this motorbike PC case, Wei had already worked on many eccentric PC tower designs under his Ai-Mask brand, with the most recent one being a rather amusing Rimowa suitcase mod. This time, Wei's teamed up with eight guys to launch the Micle brand on JD Finance's crowdfunding platform, with the first product being this "Proud of Blood" limited edition tower -- with only 99 units available -- to celebrate Intel's 30th anniversary in China. The cases will be manufactured by In Win, who has a track record of making cool-looking desktop towers. The "Proud of Blood" obviously won't be cheap: the case alone goes for 16,800 yuan (about $2,700), and it'll get bumped up to 19,800 yuan ($3,180) when it hits retail. If you really want to splash out, the top-spec option costs 56,788 yuan ($9,130) and comes with an Intel Core i7-5960X Processor Extreme Edition, an ASUS ROG R5E motherboard, 32GB of Kingston DDR4-3000 RAM, a 960GB SSD, a 3TB hard drive, two GeForce GTX 980 graphics cards and optional liquid cooling. Buyers of all pledge levels will get to fully customize the colors on their cases, as well as having their signatures engraved onto the serial-numbered crystal plate on the back. The madness doesn't stop there, as Micle is also hinting at the possibility of a wheeled transportation case for the "Proud of Blood." If you happen to reside in China and, for some reason, want to burn some cash, then you have 14 days left to decide whether to grab one of the 99 limited edition "Proud of Blood" cases, and then have it shipped to you in early June. For the rest of us, though, we'll happily keep the cash and maybe even save up for an actual Harley-Davidson bike.